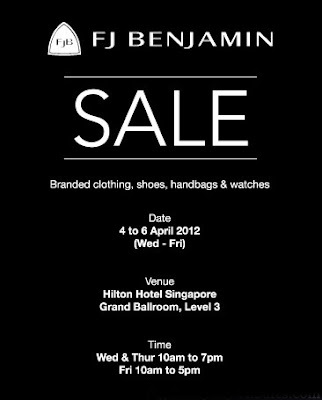 FJ Benjamin Sale last week was madness! I was activated for the setup and some other days. On Tuesday, Wednesday and Friday to be precised. Yes, I had to come back to work on a Public Holiday. But it’s all good, because we were rewarded with a $150 Voucher. Hehe. Technically I wasn’t really activated on Good Friday. I volunteered myself to work to substitute one of the sales staff. I was supposed to meet Wan for a date initially, but apparently it got cancelled for some reason. 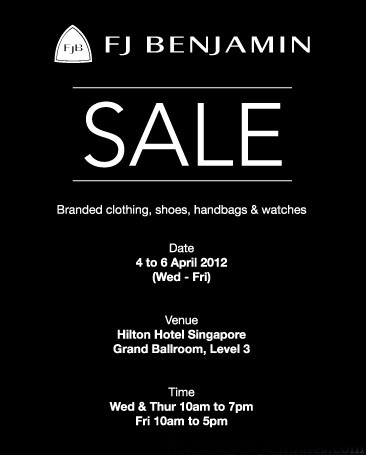 So I thought, rather than I sleep like a log at home, might as well go out and help out for the sale event. First day of the sale wasn’t that bad. But the third and the fourth day was madness! The Ballroom was crowded with “piranhas” around us hunting for the good deals. I thought after switching jobs from a Sales Assistant to a Visual Merchandiser would save me from serving customers again, but nooooo. I had to face customers again that week. Thank god it’s a “one time” thing. It was a bit awkward to serve customers again after I have stopped doing so for about a year. Haha. Then again, I had fun too. Reminiscing the times I had while working at Nine West serving bimbotic customers. Really man. Most customers are bimbotic. Those who work in a retail line would definitely get my drift. Quite thankful that I’m involved during the setup, had some time to pick up items I like before the piranhas were able to. Haahahahaha. Here are my loots that I lugged from Hilton Hotel all the way to my place! 4 Guess Handbags sum up to $120 ONLY! The Guess Wallet was selling at $20. BEAT THAT BUGIS STREET BAGS! Hahahahaha. Yeah, the three bags look almost similar but it's okay cause I really love studs! The moment I picked up those, Bren already went, "Aiyah that is so you la." How is it possible for someone whom not so close to me can tell my taste!!! Not really sure how much was the retail price but I’m actually stoked that I got 2 Marciano tops at $15 each. SAY WHAAAAAAT? I will upload the pictures next time. 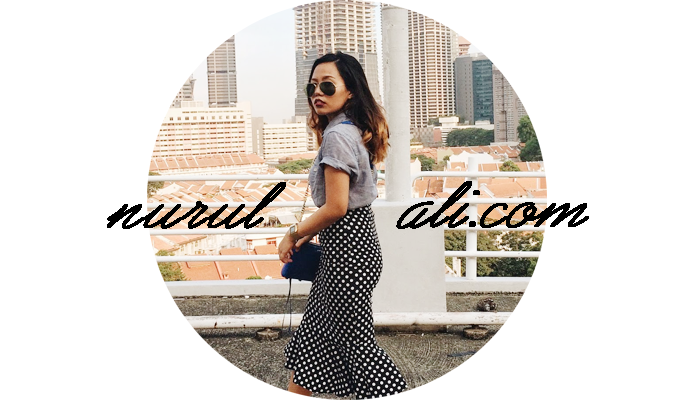 Maybe on my OOTD post. Bought a pair of RAOUL Men's Shoe for my father. I thought the shoes look really good and it tempt me to buy. After all it's so cheap! I combined my purchase with the sales staff so we got the shoes at $40 instead. Initially wanted to get this. I really like the perforated detail and the color! But the size is tad too big. Sighzaaaaa. So, the other night before heading to bed, I received an email from our Big Boss, the Founder of the company. Awwwyeahhh lunch is on the house as our reward! The moment I saw “please arrange for all these wonderful people a lunch at the office”, I got all excited! Hahaha! Can't wait! Eh but it better not be when I'm on leave hahhhh.